The progressive socialist party, commonly called the Democrats, are firmly in the "win at all costs" mode that will lead to even more violence and demagoguery. With even our sitting politicians calling for harassing our elected officials and Trump supporters, there will be confrontations so prevalent that they become commonplace. This is what the leftists want, and they are demanding that all follow the agenda that they want to put in place. Brett Kavanaugh is just the first, and if put in a position of power in the midterms, the power they wield will damage the fabric of this country and its' citizens. One of those people is "Hanoi" Jane Fonda. A woman who has moved on from the damage she has done to this country. A woman who called for the execution of American soldiers during Vietnam. The progressive socialists continue to speak of caring for our active duty men and women and to be so concerned about the veterans that to this day suffer every day from the actions they were asked to perform for our country. 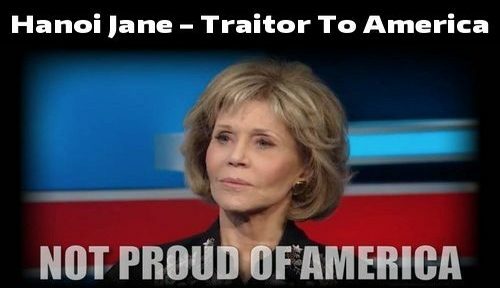 The 'pretending to care' of our socialists in government they show to the American people is a farce, and no one epitomizes that lie more than Hanoi Jane. Still using her time in Vietnam as a progressive socialist tool, and undermining her apology, was her performance at the acceptance of a "Lifetime Achievement Award" at the Traverse City Film Festival. Socialist propagandist Micheal Moore was more than willing to speak of the courage and candor of Hanoi Jane. 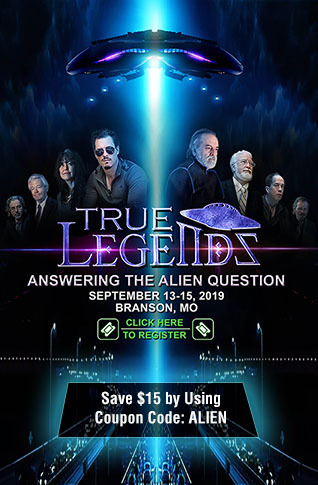 All the progressive socialists at the festival lapped up the new HBO show about her, fawning over her anti-war activism. The uninformed liberals that were there were proud of what Hanoi Jane had done in the anti-war movement in the early 70's. 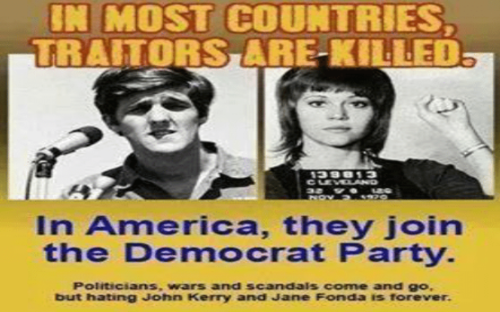 They must have been proud of Hanoi Jane calling the returning soldiers liars and traitors for telling of the torture and murders in captivity, but of course, that will not be in the documentary about her life. The documentary will be a sanitized version of her life, not showing her calling American troops baby killers, or learn of the irreparable harm she has caused to our fellow citizens. It will not show the propaganda that she initiated on Radio Hanoi calling our military men and women "war criminals" or how this damaged the psyche our soldiers and citizens. "They believed in the Army, but when they were here when they discovered that their officers were incompetent, usually drunk when they discovered that the Vietnamese people have a fight that they believed in, that the Vietnamese people were fighting for much the same reason that we fought the beginning of our country. Or in the same speech where he claims the women in the military are told by the company psychiatrist that they are there to "service" the men." Or how about upon the return of the POW's and it was Hanoi Jane leading the way in lying about their treatment. AT UCLA Fonda claimed "We have no reason to believe they tell the truth. They are professional killers. She told the New York Times that it was an orchestrated lie and that there was no torture." It will not show this woman claiming that our loss that she helped to bring about would be redemption for our country. Redemption for what? She never says. And it will not show her saying "the communist victory symbolizes hope for the planet" as she most surely did. Her latest foray into progressive socialist activism is, of course, President Donald Trump. She is very proud of the "Resistance" and the low information socialists and Antifa and anyone else who will take to the streets to protest. She is proud of those who set fires to cars, destroy businesses, of those whose only purpose is to damage our way of life. Nothing is said about the hard working people of this country who own those stores and businesses; they are inconsequential in the agenda that Hanoi Jane has followed in her lifetime. 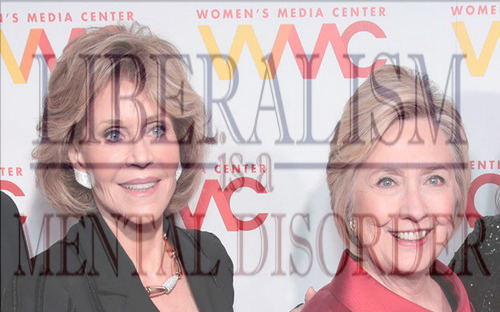 Hanoi Jane can find solace in her friends, people like Chelsea Handler, Lily Tomlin and the other celebrities who bark about our country and the failures they perceive with the citizens. The premise is that the celebrities of Hollywood and their talking heads in the media are more important than the citizens who elected our President and we need to comply with Hollywood's demands. 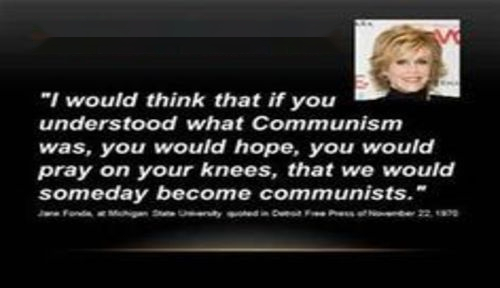 The Hollywood socialists led by Hanoi Jane do not understand that the majority of Americans do not care about the opinions that they proclaim from on high to the masses. It is of no importance to them. Because of the over-inflated egos that permeate Hollywood, the celebrities are of one opinion and that is that President Trump must go so that we can return to the disaster that was Obama. It is heartening that there is no need to listen to them for that vast majority of American because their opinion doesn't matter.